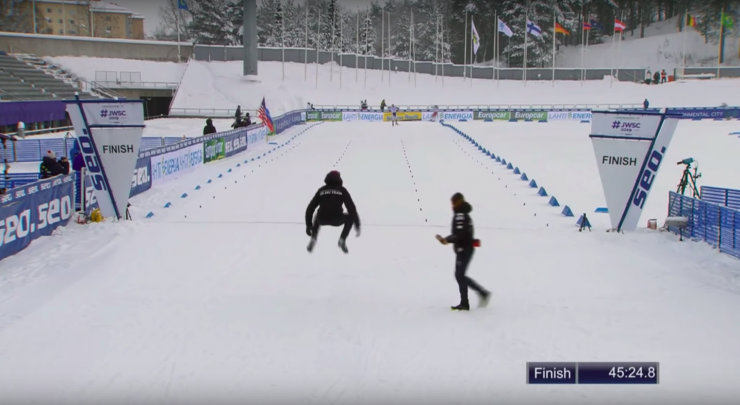 Last Saturday, the American women placed fourth in the U20 relay at 2019 World Junior Ski Championships. In any other year before 2017 this result would probably be headline news; considering that the Americans had the youngest team in the race (you can compare athlete birthdates from the women’s race here if you really want to get into the minutiae), this may well be headline news next year, or the year after that, when the same athletes are potentially contending for the podium. But a couple hours later, the U20 men went out and won their race, taking home a historic relay gold and deservedly garnering most of the headlines for the weekend. 47:57, there are literally as many USST jackets on course here as there are representatives from all other nations combined. Several Americans sprint to follow Schumacher over and around the crest of the hill, waving flags and screaming their heads off. 49:22, camera angle straight down the finishing stretch, with Schumacher narrowly but inexorably leading in Alexander Terentev of Russia. A meter past the finish line, Ogden is jumping 3 feet off the ground while Jager applauds. 49:32, Schumacher crosses the line in first. Ogden and Jager tackle/hug him. Gavin Kentch is a lifelong Alaskan. He skis with the Alaska Pacific University Masters team in Anchorage, plays with his two adorable daughters, and occasionally works as a solo attorney. He was probably on snow this year before you were.